Nike representatives expected a good-size crowd to turn up for the new Lubbock store opening Monday, but they didn’t expect a customer to wait by the front door all morning. “The Lubbock store was created to celebrate and fuel the area’s passion for sports by giving the community access to Nike premium products and services in a store that feels unique to the city,” said Dennis van Oossanen, vice president of Nike North America direct to consumer. 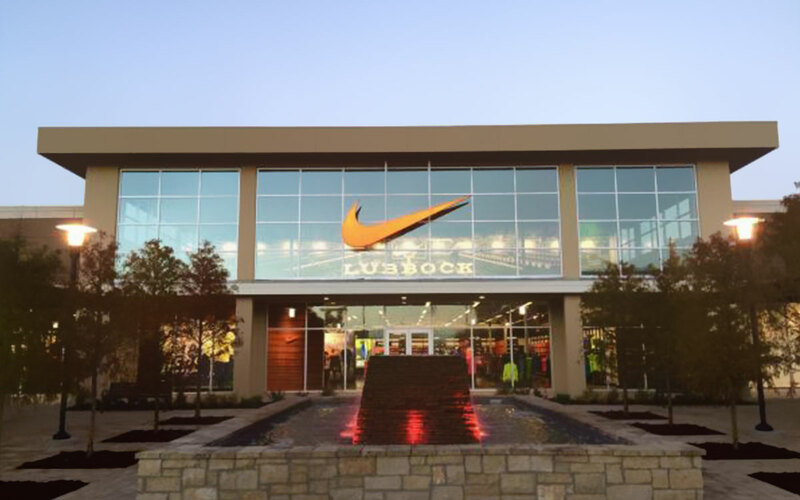 Hundreds attend opening of new Nike store in West Lubbock! The new Nike Factory store is at 2910 W. Loop 289, Ste. 805, in the West End Shopping Center. West End Shopping has an open air concept. Anchor stores will be Costco, Cabela’s, HomeGoods, Marshalls. In addition to five new pad sites along Loop 289, the next phase will provide over 100,000 additional square feet of retail, restaurants and specialty shops including Nike Factory, Banana Republic Factory, GAP Factory, Skechers Factory, Dress Barn, Charming Charlie, DXL, Torrid, Aspen Creek, and Bone Daddy’s. There will also be two hotels with business and conference amenities. The town center portion of the expansion will feature extensive landscaping and a water feature set within a pedestrian streetscape.